Whether you want a natural wood look or a particular color for your wood fence, there are plenty of fence stains on the market to meet your needs. One particular factor in choosing a wood fence stain is future maintenance. All wood fencing stains will fail in time and will need attention so it is best to choose a stain for fence structures that is easier to maintain. For wood fences we like the semi-transparent penetrating wood stains that do not darken and will fade as opposed to peeling or flaking once it fails. 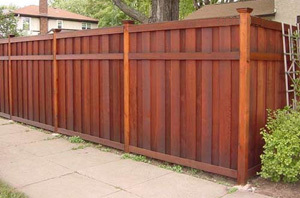 A penetrating wood fence stain is much easier to maintain in comparison to film forming or heavy pigmented wood stains. Once a semi-transparent penetrating wood fence stain begins to fail or fade, the wood can simply be washed using a wood cleaning and a recoat of stain can be applied. Regular maintenance like this keeps the wooden fence looking good all the time and will ensure it lasts for many years. Other types of wood fencing stains like the film forming type sit on top of the wood surface and do not penetrate as well. When these wood stains begin to fail they crack, peel, and flake off. You cannot wash and recoat the wood in this situation because the older bottom coat will continue to peel and flake and the new stain will fall off with it. For maintenance you have to completely remove the old failing stain with a wood stain stripper before recoating. Besides easy maintenance, we also like the semi-transparent look of the penetrating fence stains because they allow the wood grain to show through enhancing the wood's beauty. These wood fence sealers and stains come in a wide array of color and tints that provide adequate protection from the elements and add a level of beauty to a wood fence that is hard to beat. Please ask any questions as to what stain would work for your fence and wood type. The nano particles do give UV protection but not as much as the Defy Extreme in one of tinted colors. The wood should weather before applying the Defy Extreme for a few months. Was considering the TWP 1500, just wasn't too keen on the idea of letting it gray for 4 months before applying. Would the "Nano Particles" in the Defy Extreme clear, serve as the tint, semi transparency or SPF sun block? Not sure if it requires the same penetration of the 1500 product. Must have color or a tint in the stain to protect from Uv graying. For LA area, look at the TWP 1500 or the Armstrong Clark. Looking for a sealer to preserve a newly built cedar fence in Los Angeles. Faces North/South with the southside bearing the brunt of any tan inducing summer UV's, and westernmost sunsets. If you strip off the old stain and brighten the wood you could get it close but it is impossible to match old wood to new wood. I installed a cedar fence on the south side of my property in Mpls, MN 17 years ago and stained it with stain I bought at a big box store. I don't remember the brand. I installed a cedar deck last fall and I'm going to wash, brighten and stain it with Armstrong's semi-transparent Amber stain. Is it possible to get my old fence to match my new deck? If so, what products should I use?